"Learn Hypnosis, The Fun and Easy Way!" Have you ever heard that we humans only use about 10% of our brain, on average? Do you ever wonder what is the other 90% is for? I used to wonder what people would be like if we were given the missing"Manual for the Mind"at birth. Get your power back in life by tapping into the other part, the ever-working, habit-driven part of you, called your subconscious. This part of you is incredible! Time and time again, I am amazed at how people can break bad habits, get rich, falll in love, create the body they see in their imagination and more. Hypnosis really is the long-lost, missing secret to love happiness, health and prosperity. Nowadays, while other people are using less and less, you can open up your mind and use more and more of you to create a whole new life for yourself. Over a decade ago, I was a computer programmer, and I was skeptical! Then, I quit smoking using a self-hypnosis tape, which started me on the journey of a lifetime! Over the last decade, I learned how to use hypnosis to create success and I became a Master Hypnotist and a Master Trainer of Hypnosis! You may be wondering what kind of incredible things you'll be doing with hypnosis, once you learn it. By learning hypnosis, you're giving yourself the opportunity to understand the human mind in a more profound way than you've ever been able to before. Never before has so much information been offered or such an opportunity presented itself like this. The human mind is full of wonder and enlightenment and you can learn to tap into it! Learn how to communicate with people's subconscious minds to be more persuasive and influential. Take yourself off auto-pilot and live your life in control by reprogramming your subconscious mind. Stop feeling "stuck" with bad habits, bad thoughts and bad feelings and create new, good ways of living. Program your future easily and effortlessly with just 15 minutes per day of self-hypnosis! Even Make a Great Living as a Hypnotherapist! Many new hypnotherapists charge $100 /hr or more to help people lose weight, quit smoking, improve their memory and more, and YOU can learn how, too, just like I did! 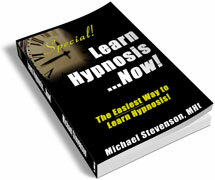 Now, You Can Learn Hypnosis From Home! I've been spending the last decade helping tens of thousands people to create the life of their dreams by teaching hypnosis and NLP to others in live workshops and trainings. Now, I'm sharing my work with millions of people by making these tools affordable and easy to use from home! Free monthly newsletter with hypnosis tips and tricks. Includes my four-part report, The Secrets of Hypnosis FINALLY Revealed! absolutely free! The book that made me famous, now available as a paperback, or as an eBook instant download! Hypnosis MP3s and CDs Go! Lose weight, quit smoking and more, just by listening to the sound of my voice - guaranteed results. Learn Hypnosis... At Home! Video Home Study Go! Watch my hypnosis training from the comfort of your own home, as you see, hear and learn how to hypnotize people with ease. Learn Hypnosis... Live! Certification Trainings Go! Attend one of my live trainings and become a Certified Clinical Hypnotherapist in just one weekend! One-on-One Sessions With Me Go! Book a one-on-one session with me for weight-loss, smoking, success, coaching and more! How to Get My Report, The Secrets of Hypnosis FINALLY Revealed, Totally Free! For a limited time, sign up for my hypnosis newsletter and you'll get my four-part report absolutely free! It's free for a limited time to my newsletter subscribers!! Just click here and sign up now to get started! PS - I normally sell my ebook for $19.99, so this is an unusual offer and won't last long. Be sure to sign up now to take advantage of this offer before it's gone! PPS - This report is NOT fluff. You'll actually learn about hypnosis, what it is, and what you can do with it, when you sign up for my newsletter. PPPS - I HATE SPAM! With as many as 1000 spam per day in my inbox, I hate it as much (or more) than anyone else. That's why I promise never to abuse your contact info. You will only receive regularly scheduled emails that you ask for. Period. Click here to sign up now and start filling in the blue box to the right of the screen. Six New Ways to Learn Hypnosis! Learn Hypnosis the free and fun way with our monthly hypnosis newsletter! Includes free report! Learn Hypnosis from the comfort of your own home with this hypnosis home video course. Get certified as a Clinical Hypnotherapist in just one weekend at our live events! Quit smoking, lose weight and more with these high-quality, professional audios from Michael. Learn about how to change your life one-on-one with Michael, and about his other live events. Get The Best-Selling Book... Now! Learn Hypnosis... Now! Is the #1 Hypnosis book on Amazon!